Lexi Angelo is a Convention Kid – she’s got a clipboard and a walkie talkie to prove it. Aidan Green is a messy-haired, annoyingly arrogant author and he’s disrupting her perfect planning. In a flurry of awkward encounters, lost schedules and late-night conversations, Lexi discovers that some things can’t be planned… Things like falling in love. Disclaimer: I was extremely lucky to receive this book as an ARC through a book club I attend! This hasn’t changed my review in any way. I knew I would fall in love with this book as soon as I read the short synopsis. It’s all the things I love! Romance, contemporary, set at a convention and including a messy haired author. Gimme! ♥ The setting! I attended YALC back in July and I loved it. This book reminded me so much of that con! ♥ The characters. Ahh, Lexi was perfect as a main character. Sure, she wasn’t right all the time. She made loads of mistakes, but that’s what makes her relatable and real!♥ The love! It wasn’t insta-love. It was slow and beautiful. This has to be one of the best, most unique contemporaries I’ve read in a while. It reminded me of the big-names, especially Rainbow Rowell! I can totally see this book going a long way. It has everything I wanted in a book. I also have to mention that this book wasn’t all about romance. Maggie managed to fit so much into this book! There was discussions about family, friends and growing up. 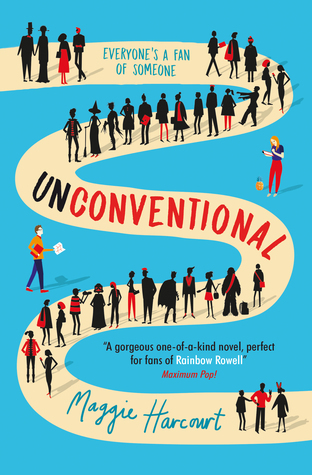 This is a unique book, contemporary YA with a twist, perfect for fans of Rainbow Rowell! and I walk right in.